Meet: Simone Taylor - a 16-year-old schoolgirl from Germany who believes 'life's too short not to have long nails'. The teenager has spent the last three years growing her talons which are now so long she's excused from PE classes for life or until she decides to give up the long-nail life we presume. Simone's nails measure an impractical but impressive 15 centimetres and take her three long hours to paint. WOAH. 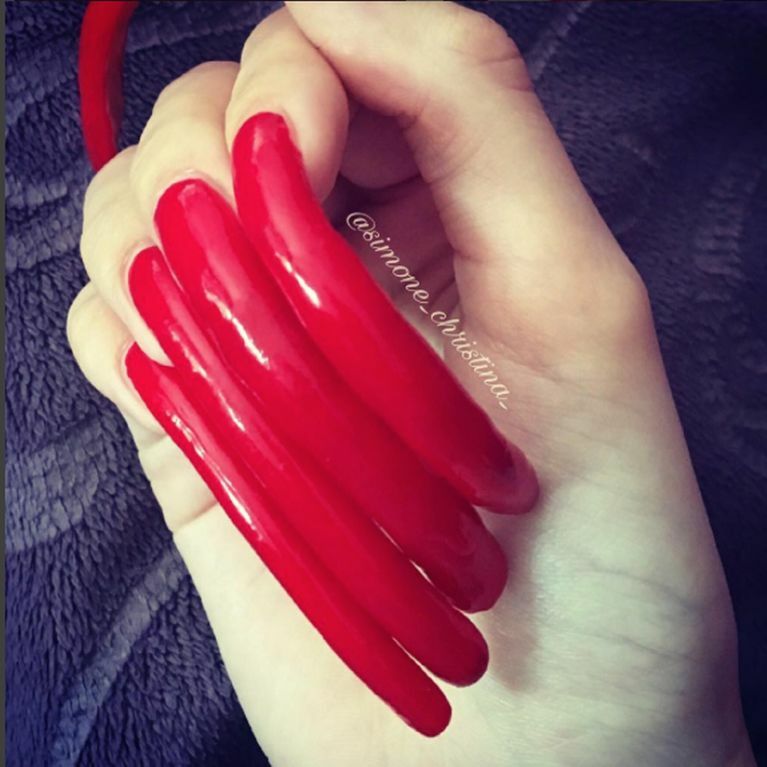 Simone Taylor is quite possibly the owner of the world's longest natural nails. The 16 year old from Nuremberg, Germany, has spent the last three years growing her talons to an impressive but impractical 15 centimetres and while we admire her commitment, we can't say we'll be following suit. The school girl can no longer participate in PE classes as the risk of her suffering from a painful break is too high and her grades in the subject have dropped as a consequence. Simone added that her PE teachers are forever persuading her to cut her nails but she admits they'll never succeed, adding she now has a genuine fear of nail clippers. As well as the daily struggles at school, Simone has to be extra careful when showering and dressing as even if her nails don't break it's painful when they get caught in her hair or clothing. But surprisingly she says the daily tasks of going to the toilet and brushing her teeth are a lot more fuss-free than people assume. Unsurprisingly, Simone - whose thumbnails measure 14.8cm with the others being shy of 12cm - has to dedicate almost three hours to painting them. This laborious routine involves removing polish and applying two base coats, a top coat, two coats of nail hardener and one application of cuticle oil. What is surprising though is the fact Simone's only broken one nail once in the two and a half years since she stopped cutting them. Recalling the tale, she said: "My friends and I were climbing a gate that was stuck, and as I jumped down, my middle finger nail got stuck in the metal and broke. I started crying and remember screaming... Fortunately, I had my nail glue with me, so I was able to fix it. I’ll never leave the house again without my magical glue."